Quick preview of thousands of photos. View, manage and edit various image formats, sounds and videos, including BMP, GIF, JPG, PNG, PSD, MP3, MPEG, TIFF, WAV, etc. Support full screen browsing, picture details at a glance. Support digital camera common RAW file format. Quickly generate slides through a set of pictures or picture folders. Use a brush to edit effects or edit a part of an image. Static image noise reduction function, restore the photo real details. Powerful development tools to reduce red eye. Auto EQ provides the ability to give images a one-touch exposure boost while viewing them. Auto Lens View lets users see what images would look like with a variety of effects. Folder Tree & GUI Enhancements allow users a seamless view of image files in a Windows format. Over 20 effects filters, including collage photo effects, Lvmv effects, and etc. Powerful intelligent filter and partial image area. ACDSee 18 normally costs $79.99 for new license key purchase and $39.99 for existing upgrading customers. 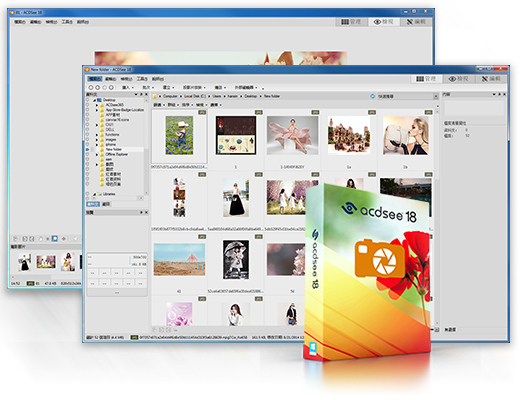 As part of promotional offer, ACDSee Systems is giving away free license key of ACDSee 18 for everyone. Log In or create new account HERE. Use unlock code to access software and license key. Start the ACD program and sign up in the “Willkommen” Window. Download and install ACDSee 18 to enjoy free 1-year license key.